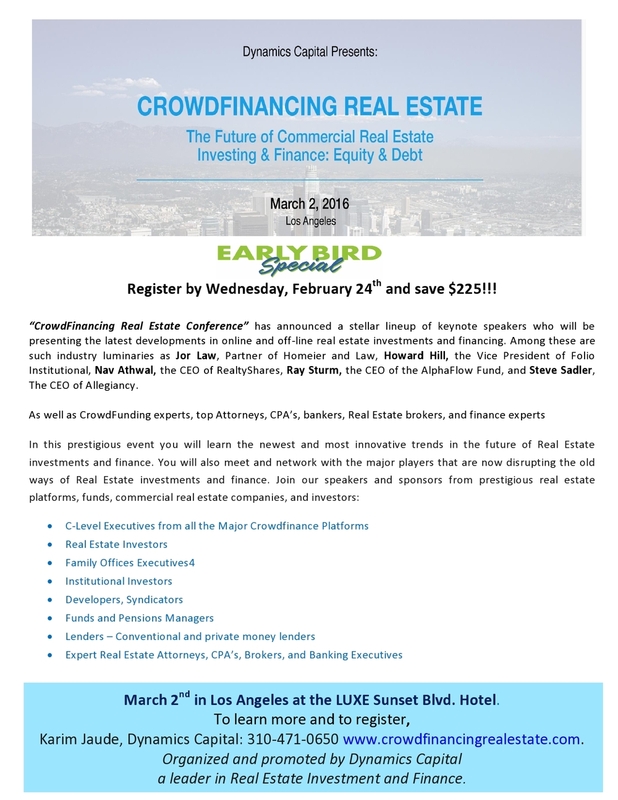 In this extraordinarily valuable commercial real estate conference, you can expect to hear the answers to these questions from professional experts in online and offline real estate investing and financing. Which online Real Estate platforms offer the best (and safest) returns? Will platforms like RealtyMogul, PatchofLand, and RealtyShares continue to pay high interest to shareholders? In a major downturn, will the major platforms have epic defaults? What will happen to those online platform’s investors? Are any online platforms in danger of failing now and taking investors with them? Will online platforms compete with Private Equity and Hedge Funds anytime soon? Are there already too many online Real Estate platforms or will there be many more to come? Will the low cost of debt change anytime soon? Will the success of the Fundrise REIT be a game-changer? In the near future will equity investments in Reg A+ offerings like Allegiancy’s replace real estate loans? Will the major RE platforms like RealtyMogul, PatchofLand, RealtyShares, and others be acquired or go public? Can the new SEC Crowdfunding rule (Title III) be used to finance smaller properties (up to $1MM) and will this rule bring non-accredited investors into real estate investing? Is there a shortage of good deals or a shortage of money for the various traditional Debt, Alternative Debt, CMBS & Equity Markets Players? Does the influx of foreign capital have any effect on the U.S. real estate market? Is traditional Real Estate syndication still alive? Will it be replaced by online platforms? What is the best way to structure real estate partnerships in this environment? Will Private Equity and Hedge funds create their own online Real Estate Platforms? What types of deals are the major private equity firms looking for? How will the online platforms affect small brokerages? How will online Real Estate investing affect the banks? Will they join in, like they have with peer-to-peer/marketplace lending? Will the largest commercial real estate companies use online platforms to a greater extent? Is online investing in real estate becoming a part of every portfolio? How does it rate as to safety against all other investments? Will the platforms go to investments even smaller than $5000? How will increased SEC scrutiny on real estate platforms and other deals affect the marketplace? What future regulatory changes can we expect? Are we witnessing a disruption in real estate financing, similar to what Google did to the Yellow Pages and Paper Maps?